This resort is designed to be a full-service retreat and luxury hotel with the most advanced amenities and classic features that any guest may enjoy. 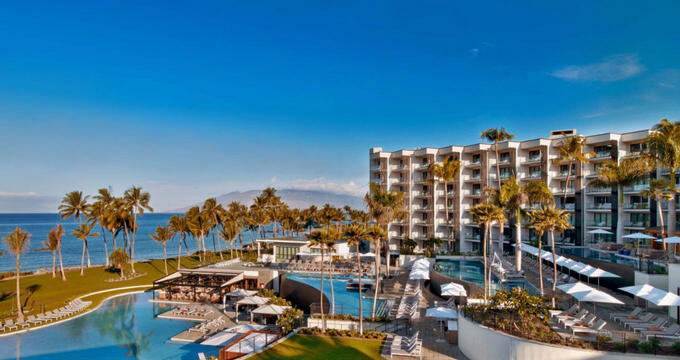 The beach is just a short walk away, the views from the rooms facing the ocean are breathtaking, and guests find themselves immersed in American and classic Hawaiian culture. You may also find yourself in a luau, feasting on Polynesian cuisine and dancing with the beat of the drums during special events. Every room inside the Andaz Maui Resort has a private balcony with stunning views of the island and the Pacific Ocean. Guests may choose from over 300 rooms, 10 villas featuring multiple rooms and a private pool located within the villa. Standard Rooms – Guests have a choice of booking a room with two queen-sized beds or a standard room with one kind-sized bed. These rooms will vary a bit based on the location of the room within the resort, but they are all within 380sf to 420sf of living space and all the basic amenities are included. When booking a standard room, the resort can put you into a room that meets your needs and wants such as having an oceanside view or an inland, mountainside view. ADA-Compliant Rooms – These rooms have the design of a standard room with features that accommodate the disabled nicely. ADA features include a cordless phone and a TV that is automatically set to have closed-captioning on for the hearing impaired. Every door, including the ones to the balconies, are more than wide enough to fit any kind of wheelchair or mobility device through so the guests may enjoy the gorgeous views. The safety equipment is specially made so that the vision or hearing impaired may still know when there is an emergency if the alarms were to go off. Suite – The suites at the Andaz Maui Resort are more than twice as large as standard rooms that offer a king-sized bed. Every room is between 850sf to 1,500sf of living space with separate areas for dining, hanging out, working, or enjoying the view from the enlarged attached balcony. Every suite is located on the oceanside part of the resort which offers full or at least partial views of the Pacific Ocean. All common amenities are included within the large suites. Villa – These rooms are the top-tier accommodations that are available at the Andaz Maui Resort. These rooms are anywhere from 1,800sf to 4,070sf of living space with upgraded amenities. Every villa has a gourmet kitchen which is furnished and replenished daily with housekeeping services. Visitors may also relax in their very own private hot tub or plunge pool, which can be selected upon booking the room. The villas have varying views, but each view is incredible, so no guest will be disappointed. They also have all the basic amenities and features that are standard within the resort, among many other upgraded features and amenities that may be customized upon request. The Andaz Maui Resort is located in Hawaii, so exploring the island(s) are a must for anyone visiting. This resort has a ton of special events all the time, so it is recommended that you check in with the desk staff or visit the website to see the calendar for activities occurring during your stay. While there are many special events that change all the time, there are more permanent activities that guests and families can include in their vacation plans. Beach – The resort owns over 15 acres of beach along the Pacific Ocean in front of the resort. Any guest may go and enjoy all the activities one can do on a tropical beach like surfing, sunbathing, swimming, and relaxing with cool beverages. The Feast at Mokapu – The resort offers visitors an intimate look into the culture of the indigenous Polynesian people through a luxury luau. These events are scheduled on every Tuesday and Sunday evenings. Premium seating and classic seating are available for adults and children. The feast is prepared by the resort’s executive chef which is included in the pricing. The cuisine is ‘ohana-style food that is carefully prepared for every guest that honors the legacy of Hawaii’s Polynesian ancestors and heritage. Personalized cocktails and drinks are available to bring the entire experience together, making this an event to remember. Fitness Classes and Groups – Guests need to get their exercise in even when on vacation, so the resort offers the best fitness and strength equipment in the fitness center located within the resort. Anyone staying in any room in the resort is welcome to participate in the fitness activities. The resort offers Pilates, ultimate fitness, core conditioning, calorie torch, bootcamp, sunset yoga on the beach, and sunrise yoga on the beach. Personal trainers are also available upon request. The Andaz Maui Resort doesn’t have any shopping opportunities on-site, but there are an almost infinite number of places to shop in the immediate area. Vacationers will find a large variety of shopping experiences available to them, including common American chain stores that most are familiar with. But, the area also has a bunch of shops that give shoppers a unique experience with even more unique products and services. The best places to visit in the immediate area are the shopping malls and business areas near the hotel. South Maui – The area located in the southern part of the island has high-end shops with unique clothes and accessories, eateries, restaurants, and souvenir shops. If high-end doesn’t quite suit you, there are plenty of other places that are budget friendly that offer beachwear, popular fashion, unique accessories, mementos, and local or American food. While in the area, you can also visit the Kihei Kalama Village Marketplace or the Azeka Place Shopping Center to find more shops with various products and services. Kahului – This area has the more common American stores like Costco, Wal-Mart, and fast food. These are great places to buy the fun items for the beach, so you don’t have to travel with them. In the evenings, the shops stay open later than most others, and the downtown becomes a happening place full of busy shoppers. North Shore –Visitors can find modern and vintage shops with unique apparel and products found nowhere else in the world. The art district is housed in North Shore, which has many various shops full of all kinds of art from local artists. The resort offers many dining experiences that offer classic tropical cuisine at affordable prices. Guests can choose from any of the four restaurants and one beach bar located within the resort. Ka’ana Kitchen – This restaurant serves the freshest farm-to-table food that is made into the classic dishes of Hawaii. Guests will find true, authentic flavors of Maui here while relaxing in a modern, elegant environment. Bumbye Beach Bar – The Lagoon Pool with the resort houses this beach bar that serves lunch-type items along with all the favorite drinks and flavors of the island. Mokapu Market – If eating out isn’t on the schedule, guests can take advantage of this fresh food market that is open 24 hours a day. The market serves fresh to-go items along with other locally sourced ingredients, fruits, vegetables, and other foods. Lehua Lounge – This lounge offers guests a casual experience and serves delicious handcrafted cocktails and dinner-type cuisine. Morimoto Maui – This restaurant is owned and ran by the famous Masaharu Morimoto. Eating here is a must during a stay at the Andaz Maui Resort. The Andaz Maui Resort has a large, modern spa for any guest to enjoy. Various services and products are available within the spa. Any party wishing to book a wedding will find that this resort has one of the most gorgeous wedding accommodations in the world. The resort offers over 70,000sf of space for weddings, receptions, and comes with a professional wedding designer and planner. Catering, spa services, and photographers are available as well.